Unfortunately I haven’t had a chance to play that game since I was a kid, but with all the times that I played that and other board games, all those memories are definitely a fond walk down memory lane! Then when a friend of mine and the CEO of Awesome B Movies, ‘Matt Dowling’ told me about the movie… Well needless to say, I was quite excited to see it… And I have to admit that now that I have, I am quite pleased that I did! You see this movie, which has an all star cast that includes, Eileen Brennan (Murder By Death), Tim Curry (McHale’s Navy), Madeline Kahn (Paper Moon), Christopher Lloyd (Back To The Future), Michael McKean (Planes, Trains & Autom0biles), Martin Mull (Mrs. Doubtfire), Lesley Ann Warren (Secretary), Colleen Camp (Apocalpyse Now) & Lee Ving (Streets Of Fire). Also I thought that I should mention here the fact that this movie is based on the story by, Jonathan Lynn (Nuns On The Run) a man who also wrote the screenplay for this movie and who also directed this movie as well! Also as far setting up the story I also wanted to mention John Landis (An American Werewolf In London). Now John Landis is a true legend in the field of movies in general, but most specially in my opinion with having helped create some of the most awesome movies of the 1980s! Including such films as: The Blues Brothers (1980), Twilight Zone: The Movie (1983), Spies Like Us (1985), and even iThree Amigos! (1986)! 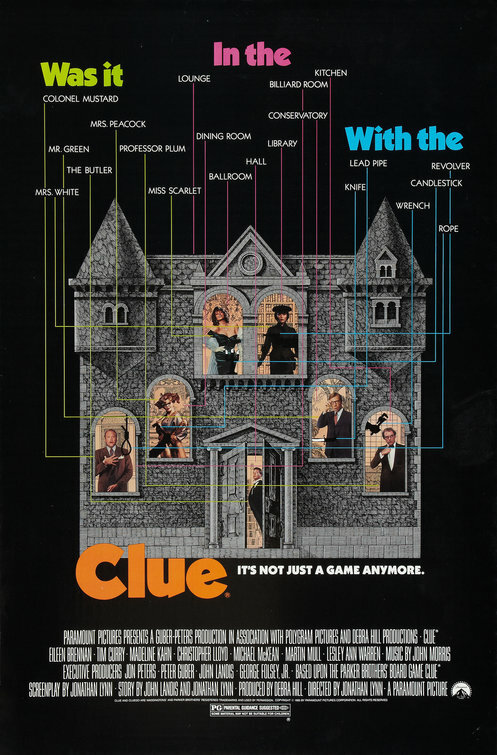 And as far as the writing, this awesome movie, (which is based on the classic board game), does bring back all of the popular characters from the board game, including: Mrs. Peacock (Brennan), Mrs. White (Kahn), Mr. Green (McKean) and even Colonel Mustard (Mull) in this hilarious look at a 1950s film noir style whodunit! 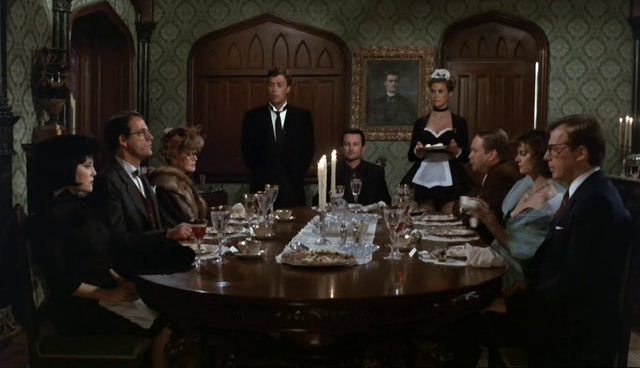 Professor Plum, Colonel Mustard, Mrs. Peacock and the rest of the gang as they settle in for dinner at the creepy. ‘Hill House’! What I mean by this is that a group of people are invited to, ‘Hill House’, a creepy style mansion some where outside of Washington D.C. on a dark and stormy night for a dinner party… But there is a trick to all of this you see, the trick is, is that everyone that is a part of this party, not only can not tell their real names or why they have been brought together! In the end, this movie is utterly hilarious and a good time, and if you give this one a chance, you might find out the same thing!